The casino, which is set amid the streets of Paris, features 100 gaming tables and more than 2,000 slot machines. The 85,000-square-foot casino includes a special section of high-limit table games. The resort’s signature dining experience rests 11 stories above the Las Vegas Strip in the Eiffel Tower. 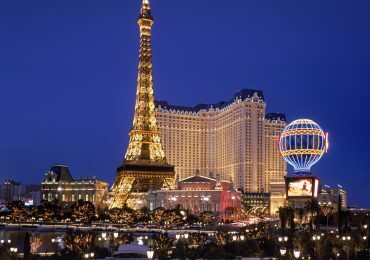 Paris also offers eight diverse French-inspired restaurants: La Rotisserie des Artistes (French), Mon Ami Gabi (Parisian brasserie), Le Provencal (Italian), Le Café île St. Louis (coffee shop), JJ’s Boulangerie (bakery), du Parc Café, La Chine (Hong Kong) and Trés Jazz (New-world Caribbean). Le Village Buffet has offerings from all five provinces of France. The 2,916 guestrooms, including 295 suites, are contained in the 34-story tower. The hotel is modeled after the famous Hotel de Ville, and the rooms feature custom-designed furnishings, crown moldings and rich French fabrics.